The final resting place of the world leader of revolution has been closed for renovation and placed under an inflatable dome. The mausoleum is located above a ditch where shifting soil and water are destroying its rear wall. For four months, visitors to Moscow will be unable to see the mausoleum containing the body of the leader of the world's proletariat. 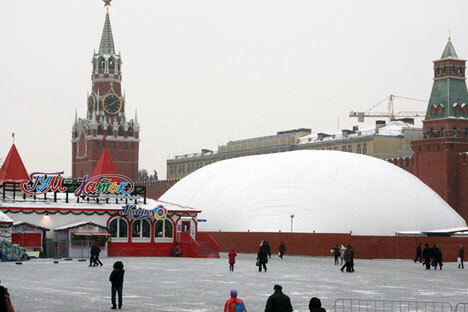 A giant inflatable dome has been erected over Lenin’s tomb and will act as a shield to protect the mausoleum from the large-scale renovation of the building’s damaged rear wall. The dome is scheduled to be removed on April 30, 2013 – just in time for the May 1 celebrations. Lenin’s body will remain in place during the work, as usual, enclosed in its normal sarcophagus. “No action will be taken regarding Lenin’s body,” said Sergei Devyatov, advisor to the Federal Security Service. Actually, scientists plan to carry out work on Lenin’s body in February, but this is routine medical maintenance work that is not directly connected to the Federal Security Service’s responsibilities. The repairs to the mausoleum and the condition in which Lenin’s body is preserved are in no way connected. On the contrary, the Federal Security Service says that Lenin’s body is currently in a “more than satisfactory” condition, while the state of his tomb is deteriorating continuously. The foundations of the mausoleum – originally built in 1930 by architect Alexei Shchusev – are cracked. The flaws in the foundation are not the fault of the architect, but rather a consequence of Moscow’s topography. Until the 18th century, the Kremlin was actually located on an island. It was separated from what is now Red Square by the Aleviz Moat – a massive fortification. When Napoleon’s army retreated from Moscow, they blew up and burned down the Kremlin’s towers and palaces. Afterward, to rebuild the Kremlin faster, the moat was filled in. However, it was enormous: 98 feet deep and up to 95 feet wide. There was not enough stone and soil to fill the whole thing in, so workers used whatever was on hand – including the debris and wreckage of the burned-down structures. The result is often termed “heterogeneity of soils,” in modern language. The mausoleum was built directly on top of where the medieval moat had been. The ATECS department of the Federal Security Service, which is responsible for the construction and maintenance of buildings of federal significance, undertook an analysis of the building and came to the conclusion that the urgent resolution of two problems is required: to repair the mausoleum’s foundations and to staunch the flow of water beneath them. Stanislav Kuner, deputy director of ATECS, says that the flow of water already poses a critical threat – particularly to the rear wall of the mausoleum, where it has caused flaking stone and damage to the supporting structures. According to Chief Architect Olga Galanicheva, the main task at present is to halt the sinking. Due to the shifting soil beneath it, the mausoleum has dropped through the foundations and is standing on one corner – in some places where water is flowing through, the walls are seeping water, and this threatens the integrity of the interior. The builders are adamant that the mausoleum is not being rebuilt – only refurbished. However, Kuner says that one annex section of the mausoleum will disappear in the refurbishment: In 1983, an inconspicuous building was built on the Kremlin walls to conceal the escalator Soviet leaders used to ascend to the viewing platform atop the mausoleum during official parades. Even though almost all of the Kremlin is under UNESCO protection, international experts are not opposed to the demolition of this remade extension. As Anna Zhukova, assistant project manager at the mausoleum explained, neither the viewing platform nor the escalator is used any longer.